The goal of legal marketing is to increase the reputation of your law firm and attract your ideal clients, eventually creating a self-sustaining, automated system that basically runs itself. 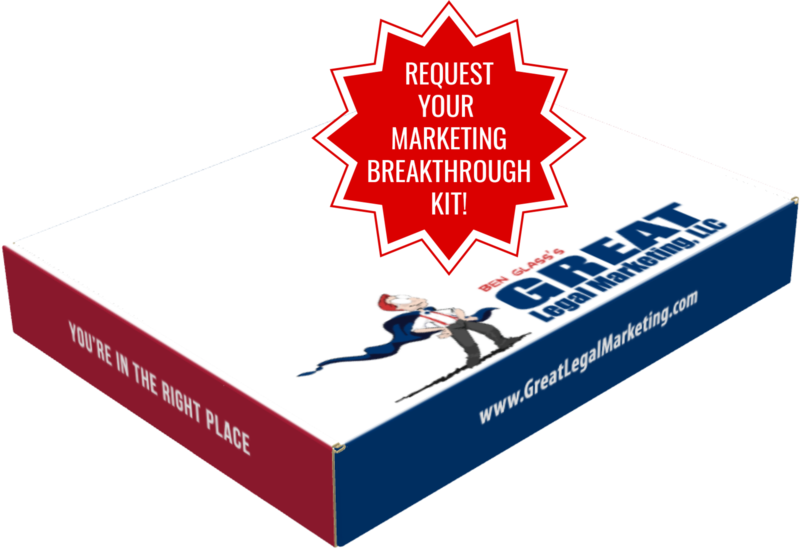 Your hard work in setting up new lawyer advertising ventures and legal marketing plans is all in hopes that you'll never have to market again once things get rolling. This sounds ideal, work hard now, and let it pay off for the rest of your career. It's possible, I've seen plenty of lawyers like myself and many of my Great Legal Marketing SuperConference attendees accomplish this goal. However, when I say that you'll never have to market again, I don't mean you ignore your legal marketing completely. One of the biggest parts of your legal marketing strategy should be follow-up with your lawyer advertising. Good legal marketing strategies and lawyer advertising require the client to react to what they're seeing/hearing/reading and calls them to action. This action in the best cases is to order your information package, set up a consultation, or any other method of hand waving that says, "Hey lawyer, I'm interested!" So your legal marketing is making clients get up and approach you - what do you do about it? If you're sitting there staring at their request, it's useless until you DO SOMETHING. Once you get that response from your lawyer advertising you need to pounce on it and respond quickly. Don't be a jerk by ignoring client requests for more information that you made them ask for in the first place. If your website is offering a free copy of your guide to motorcycle accidents, make sure that you've got a smooth system in place to turn that request into a quick response. If it's a physical book, you should have a stack of them packed and ready for a mailing address and postage to be slapped on. If it's a digital version, your client database should be automated to getting your e-mail attachment out. Requests for information aren't the only ways that clients interact with your legal marketing and lawyer advertising methods. Continue reading to see why you need to pay attention to your social media and blog comments as well.